AUSDOM ANC7 Active Noise Cancelling Wireless Headphones Over Ear,Bluetooth Headset AptX Hi-Fi Sound Headphones with Microphone/Carrying Case for iPhone/Android/PC/TV Devices/Airplane. ANC (ACTIVE NOISE CANCELLING) SYSTEM: Cancelling background noise effectively, and smartly designed headphones will enable you enjoy the pure quality of your favorite music.Suitable for use indoors and outdoors with ANC tech. You can rest assured that the active noise cancelling headphones can be seamlessly switched between different devices of your cellphone, tablet or computer. Besides, the ANC8 is designed specifically for use with iPhone, iPad and Mac models. Features Wired and Wireless Headphones Bluetooth V4.1 EDR, Built-in microphone for headset functionality with controls for media and phone calls. High-grade leather headband earmuffs Unique ShareMe Function: Headphones-to-headphones audio sharing allows simultaneous, wireless music-listening or movie-listening among 2 ShareMe-equipped headphones with your family, friends and etc. ShareMe technology, Experience sharing happiness Comfortable and Foldable Design: Leather-style padded earmuffs, allowing you to wear them for a long time comfortably. Foldable design make it more portable to carry and storage..
Trending at $29.80eBay determines this price through a machine learned model of the product's sale prices within the last 90 days. Features EXCELLENT SOUND QUALITY: The headphones contain powerful 50mm headphone speaker drivers and made with the latest style copper carbon and rare earth metals for maximum fidelity and powerful bass. SMART DESIGN: Memory sponge ear muffs giving you maximum comfort.Foldable design and light weight make Headphones more portable for easy carrying. Excellent battery life with 18 hours of music time WIRELESS/WIRED: Can be used both wirelessly via Bluetooth 4.0 EDR and wired (via the 3.5mm audio cable). 【COMFORT AND THE PERFECT FIT 】: You can wear the Bluetooth headphones for hours, and your head and ears won’t be sore afterwards! The high grade protein leather pads and the ergonomically designed adjustable and stretchable headband will allow you to have the perfect and most comfortable fit. BUY IT NOW, PLEASE CLICK HERE! Features HIGH-FIDELITY AUDIO EQUIPMENT AND SYSTEM Featuring the Bluetooth 4.0 CSR technology and the close-back design can provide immersive Hi-Fi sound and also produce tremendous sound quality with deep bass and crystal clear high pitch ​​ COOL APPEARANCE & COMFORTABLE DESIGN Excellent ear lap design adds the cool black , and it also has extraordinary durability. The Artificial protein leather ear cushion , which can give your long-time comfortable wearing ​. Lightweight design allows you to listen to your music anywhere you go without having the bulky heavy feel. 1X stereo headphone. Built-in Microphone supports calls and music, so you can take hands-free calls and listen to music. BUY IT NOW, PLEASE CLICK HERE! Features EXCELLENT SOUND QUALITY: The headphones contain powerful 50mm headphone speaker drivers and made with the latest style copper carbon and rare earth metals for maximum fidelity and powerful bass. SMART DESIGN: Memory sponge ear muffs giving you maximum comfort.Foldable design and light weight make Headphones more portable for easy carrying. Excellent battery life with 18 hours of music time WIRELESS/WIRED: Can be used both wirelessly via Bluetooth 4.0 EDR and wired (via the 3.5mm audio cable). BUY IT NOW, PLEASE CLICK HERE! Features ERGONOMIC DESIGN COMFORTABLE BLUETOOTH HEADPHONE: - Superior Rubber oil process material on each ear cup cushion, adjustable band and the super lightweight make AH862 a great choice for bluetooth headset.High-grade leather headphone sheath and ear pads allows you to use a variety of places : office, games, home, and also good street matching items. OUTSTANDING SOUND QUALITY : - 40mm large-aperture drivers and csr chip make a wonderful Deep, Powerful Sound For the Music you Love.It shows the ability to sell your satisfaction in every audio.It's better to try it in person.. Features OUTSTANDING AUDIO PERFORMANCE- How good is the sound? Featuring the newest Ausdom sound production technology, you will experience crystal clear sound CD-like sound effect. The dynamic 50mm drivers and full frequency response design deliver rich bass, extended treble and high fidelity sound. 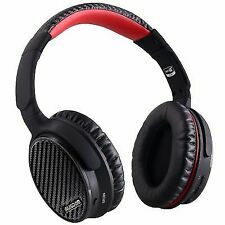 SUPER COMFORTABLE BLUETOOTH HEADPHONE- These wireless headphones feature a leather padded design with soft ear cushions and a stretch headband.Suitable for use at work, home or while travelling, this headphones provide superior sound quality and are comfortable to wear all day long.Earmuffs can be removed and installed. Features 【Active Noise Cancelling Technology】 Ausdom advanced ANC technology significantly reduces noise to help you focus on what you want to hear. ANC works both with and without the audio cable and is great for reducing noise during long trips on a plane or in places with city traffic. 【Comfort And The Perfect Fit】 These noise cancelling headphones are made from exquisite materials simulated to human skin texture. Combined with the custom fit supra-aural padding and an adjustable headband, ANC8 gives you the best fit and long-term comfort. We also attach due importance to better user experience while pursuing the high sound quality. 【ONE YEAR WARRANTY 】: Here at AUSDOM, we’re very confident about the quality, the durability, the efficacy and the practicality of our active noise cancelling Bluetooth headphones. For this reason, we have backed them up with one year warranty. 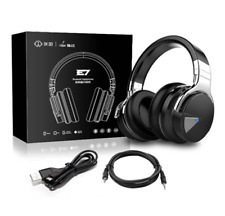 Features WIRELESS HEADPHONES: Bluetooth V4.1 EDR Stereo Headphones – The newest and most advanced Bluetooth technology. You can connect these headphones to any Bluetooth device, such as a PC, Smartphone, TV, Game Console, and enjoy dynamic sound and the freedom of wireless convenience LONG BATTERY&BUILT IN-MICROPHONE: These H8 model over ear headphones have a long lasting rechargeable battery, with a usage time of 15 hours for talking, 12 hours playing music, and standby time of more than 1800 hours. Built-in microphone and control buttons for media and hands-free phone calls OUTSTANDING SOUND QUALITY: The wireless headphones have powerful and rich bass speakers to bring you an amazing and unprecedented audio playback with... .
BUY IT NOW, PLEASE CLICK HERE! Features: Can be used both wired (via the 3.5mm audio cable) and wirelessly via Bluetooth 4.0 EDR. Special speaker transmits high ﬁdelity & powerful bass and detailed wireless sound to your ears. Thickening earmffs giving you long-time comfort. Foldable design and light weight make it more portable to carry. Up to 20 hours of music playing time and talking time, standby time more than 2000 hours. Built-in microphone for headset functionality with controls for media and phone calls . Features 【Active Noise Cancelling Technology】 Ausdom advanced ANC technology significantly reduces noise to help you focus on what you want to hear. ANC works both with and without the audio cable and is great for reducing noise during long trips on a plane or in places with city traffic. 【Comfort And The Perfect Fit】. NFC function allows to connect your NFC-compatible devices in a fast and convenient way Giving Long-time Comfort -- Artificial protein leather of earmuffs simulated to human skin texture Built-in microphone for headset functionality with controls for media and phone calls, compatible with all the Bluetooth-enabled device Durable Strong Power -- Build-in 400mA rechargeable battery, provide about 20hours music playing time and more than 250 hours standby time DWS Technology -- an exclusive detailed-wireless-sound system combines the latest Bluetooth technology, perfect tuning technology and the ear engineering technology​ Packing:Ausdom M04 Headset, USB Charging Cable, 3.5mm Audio cable (4feet/ 1.2m), Use... . Features 【Active Noise Cancelling Technology】 Ausdom advanced ANC technology significantly reduces noise to help you focus on what you want to hear. ANC works both with and without the audio cable and is great for reducing noise during long trips on a plane or in places with city traffic. 【Comfort And The Perfect Fit】 These noise cancelling headphones are made from exquisite materials simulated to human skin texture. Combined with the custom fit supra-aural padding and an adjustable headband, ANC8 gives you the best fit and long-term comfort. We also attach due importance to better user experience while pursuing the high sound quality. . Features HIGH-FIDELITY AUDIO EQUIPMENT AND SYSTEM Featuring the Bluetooth 4.0 CSR technology and the close-back design can provide immersive Hi-Fi sound and also produce tremendous sound quality with deep bass and crystal clear high pitch ​​ COOL APPEARANCE & COMFORTABLE DESIGN Excellent ear lap design adds the cool black , and it also has extraordinary durability. The Artificial protein leather ear cushion , which can give your long-time comfortable wearing ​. Ausdom M07 Wireless Bluetooth Music Gaming and Laptop Headphones with MIC. Condition is New. Shipped with USPS First Class Package. Features 1. High quality and brand new, this full size portable over the ear headphones with high definition sound and adjustable headband is designed to be simple but yet elegant to hold and use. 2. Added over the ear padded soft cushion offers superior comfort and fitment, providing you with superior audio experience. Ergonomic design make this wired headphones comfortable to wear even for those who wear glasses and long time using. 3. Stylish and durable, our Ausdom over ear headphones with built-in microphone allow you to listen to your music anywhere you are, clear calls are ensured. . Features ERGONOMIC DESIGN COMFORTABLE BLUETOOTH HEADPHONE: - Superior Rubber oil process material on each ear cup cushion, adjustable band and the super lightweight make AH862 a great choice for bluetooth headset.High-grade leather headphone sheath and ear pads allows you to use a variety of places : office, games, home, and also good street matching items. OUTSTANDING SOUND QUALITY : - 40mm large-aperture drivers and csr chip make a wonderful Deep, Powerful Sound For the Music you Love.It shows the ability to sell your satisfaction in every audio.It's better to try it in person..
BUY IT NOW, PLEASE CLICK HERE! Features: Hi-fi Surround Sound, Built-in Noise Isolating Microphone. Comfortable and durable leather Ear pads. Y stereo splitter connects into both the audio and microphone ports on your desktop or laptop computer. Support MP3/MP4/Tablet/Mobile phone/PC/PS4. 40mm driver units supply deep bass and clear sound. Built-in microphone and hands-free, enjoy playing games. BUY IT NOW, PLEASE CLICK HERE! Features Designed for an excellent listening experience, Ausdom F01 wired headphones with around-ear cushion design can provide robust, immersive and Hi-fidelity sound. The design fits into lively, urban style and pace, let it be part of your music experience and life's best moments. Immersive Hifi Sound Equipped with 40mm powerful driver, the high quality, economical and over-ear stereo headphones provide your superior audio experience, clean well-balanced bass, clear mid-tones and treble. Designed specially for those who enjoy music with exceptional quality sound. . Features: Can be used both wired (via the 3.5mm audio cable) and wirelessly via Bluetooth 4.0 EDR. Special speaker transmits high ﬁdelity & powerful bass and detailed wireless sound to your ears. Thickening earmffs giving you long-time comfort. Foldable design and light weight make it more portable to carry. Up to 20 hours of music playing time and talking time, standby time more than 2000 hours. Built-in microphone for headset functionality with controls for media and phone calls Ausdom AH2 Specification. Features: Hi-fi Surround Sound, Built-in Noise Isolating Microphone. Comfortable and durable leather Ear pads. Y stereo splitter connects into both the audio and microphone ports on your desktop or laptop computer. Support MP3/MP4/Tablet/Mobile phone/PC/PS4. 40mm driver units supply deep bass and clear sound. Built-in microphone and hands-free, enjoy playing games. Features of M04s NFC Bluetooth Headset: 1. Only touch lightly with NFC area, Easy to pair. Special speaker transmits high fidelity & powerful bass and detailed wireless sound to your ears. The best combination of tuner's technology and art gives you full range audio spectrum, clear and transparent bass, midst and highs, fully exposed to all the details of song. Headphones Only as pictured. Good Condition. Work Fine.